Written by Catherine Saxelby on Tuesday, 26 June 2018. This month I want to look at an old winter warmer favourite, soup. Soups are great. They’re filling, you can use up leftovers or start from scratch and they’re a definite crowd-pleaser on a cold night. 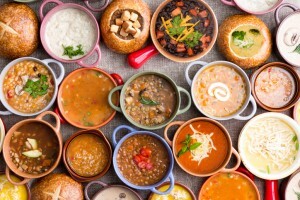 This June edition of the Foodwatch Newsletter points you to some of my many posts on soup as well as where to find the easiest and tastiest soup recipes. Vitamins - What, Why and Where is about to launch so get in quick! If you PRE-ORDER now, you can snag a copy for only A$4.99 and save $5, that's a 50% saving!!! I'll tell you all about it in this month's newsletter, plus we announce the winners of our May Messy Monkeys Competition and much more! So, while you can read the June 2018 Foodwatch Newsletter on the web, why not subscribe here to our monthly Foodwatch Newsletter and have it delivered to your Inbox on the last Tuesday of every month? The Foodwatch monthly email newsletter is free and you can unsubscribe at any time yourself and we don't give your email address to anyone (we too hate spam!). If you like what you read, why not subscribe? April 2018 Foodwatch Newsletter - A hearty winter recipe plus much more.